There are varied opinions regarding the law of God that are circulated among Christians today. 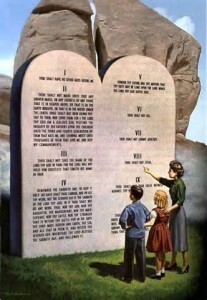 Some say that the Ten Commandments have been done away with, while others maintain that they are still in effect. This study is designed to examine what the Bible says concerning this issue. Let’s consider the giving of the Ten Commandments at Sinai. “And God spake all these words.” (Exodus 20:1) God did not entrust the giving of the Ten Commandments to any man, but spoke them Himself. “For who is there of all flesh, that hath heard the voice of the living God speaking out of the midst of the fire, as we have, and lived?” (Deuteronomy 5:26) It was an awesome thing for humans to hear the voice of the living God. “I know that, whatsoever God doeth, it shall be for ever: nothing can be put to it, nor any thing taken from it: and God doeth it, that men should fear before him.”(Ecclesiastes 3:14) Whatever God does, it will last forever. Man is not permitted to add anything to it or take anything away from it. “For I testify unto every man that heareth the words of the prophecy of this book, If any man shall add unto these things, God shall add unto him the plagues that are written in this book: And if any man shall take away from the words of the book of this prophecy, God shall take away his part out of the book of life, and out of the holy city, and from the things which are written in this book.”(Revelation 22:18, 19) “What thing soever I command you, observe to do it: thou shalt not add thereto, nor diminish from it.” (Deuteronomy 12:32) It is a very serious thing to attempt to alter those things which God Himself has spoken. Did the Lord change His mind after He spoke the Ten Commandments at Sinai? “For I am the Lord, I change not; therefore ye sons of Jacob are not consumed.” (Malachi 3:6) God does not change. Man may go to great lengths to prove that God has changed His mind concerning the moral law which He spoke at Sinai, yet the Scriptures say that God does not change. Did Christ Change the Law? According to Jesus the law of God is to stand until “heaven and earth pass.” Obviously this has not occurred yet, so naturally the law has not been done away with. Jesus went on to say that it was a dangerous thing to teach men to “break one of these least commandments.” It is very plain that the law, which Jesus was referring to, is the Ten Commandment law for the rest of the chapter deals with Jesus expounding on certain points within this law. As we can clearly see, God will have a group of people in the last days who will keep His law. What is the biblical term for those who break the law? “Whosoever committeth sin transgresseth also the law: for sin is the transgression of the law.” (1 John 3:4) Consequently, one who transgresses the law of God is called a sinner. Certainly there are some who will quickly protest, claiming, “We cannot keep the law of God, we can never stop sinning.” It is true that we cannot keep the law of God in our own strength. “Because the carnal mind is enmity against God: for it is not subject to the law of God, neither indeed can be.” (Romans 8:7) Yet the Lord has told us that we must keep the commandments to enter into the kingdom of heaven. Surely there must be some remedy for sin. Suppose a known thief comes to your church seeking membership, claiming that he wants to give his life to the Lord and asking for prayer that he might give up his habit of stealing. Suppose the pastor tells this man, “My friend, you have it all wrong; don’t you know that we can never stop sinning? Just accept Jesus as your Saviour and everything will be okay.” Certainly any conscientious individual would immediately see that the pastor’s reply is wrong. Yet many pastors make similar statements without raising the slightest suspicion in the listeners. If it is true that we cannot stop sinning, then where do we draw the line? Is it only that we cannot stop sinning when it comes to seemingly small sins such as lying and coveting, or would we say that we cannot stop sinning when it comes to such sins as adultery? One may say that these sins cannot be avoided. Why stop there? If it is true that the compulsive liar cannot give up lying, then it must also be true that the murderer cannot give up murdering and the thief cannot give up stealing. If this were the case then this world would be filled with nothing but the vilest of criminals. It is very obvious that the assertion “we cannot stop sinning” is completely contrary to common sense, but is it contrary to the Bible? “There hath no temptation taken you but such as is common to man: but God is faithful, who will not suffer you to be tempted above that ye are able; but will with the temptation also make a way to escape, that ye may be able to bear it.” (1 Corinthians 10:13) Praise God! He has promised us that there is no temptation that will ever come upon us from which we cannot escape. God always provides a way out of sin. Thank God that Satan cannot force us to sin. What shall I do when I am tempted? “For the priesthood being changed, there is made of necessity a change also of the law.” (Hebrews 7:12) “For there is verily a disannulling of the commandment going before for the weakness and unprofitableness thereof.” (Hebrews 7:18) Paul is referring to a law that is weak and unprofitable. He said that since the priesthood has changed there must also be a change of the law. It is obvious that the law Paul was referring to was not the Ten Commandments, for they had nothing to do with laws concerning priests. Moreover, the Ten Commandment law is not weak and unprofitable, but “holy, and just, and good.” The law that was changed due to the changing of the priesthood is the ordinances concerning the sacrificial system, the priests, and the sanctuary service, for they were unprofitable. “Wherefore then serveth the law? It was added because of transgressions,… Wherefore the law was our schoolmaster to bring us unto Christ, that we might be justified by faith. But after that faith is come, we are no longer under a schoolmaster.” (Galatians 3:19-25) The law of God speaks only to them who have broken that law. “Now we know that what things soever the law saith, it saith to them who are under the law: that every mouth may be stopped, and all the world may become guilty before God.” (Romans 3:19) Once we have come to Christ and have been justified (literally made innocent), the law has nothing to say to us for we stand before God as if we had not sinned. Hence we are no longer in need of a schoolmaster. The moment we again break that law, the law is there to testify that we are a sinner. Hence we again need that schoolmaster to bring us back to Christ. If there were no law to tell us that we have sinned, we would continue in a deplorable condition. “What shall we say then? Is the law sin? God forbid. Nay, I had not known sin, but by the law: for I had not known lust, except the law had said, Thou shalt not covet.”(Romans 7:7) Thank God for His law, for without it we would be liars, thieves, murderers, and such like. 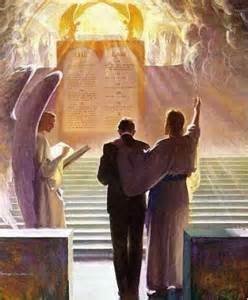 “My little children, these things write I unto you, that ye sin not. And if any man sin, we have an advocate with the Father, Jesus Christ the righteous.” (1 John 2:1) God wants us to cease from sin, which is transgression of the law. If the law has been done away with, I confess to you that it is not possible for anyone to sin, for how can one break a law that does not exist? If the law was done away with, it is perfectly just and right to murder, steal, commit adultery, etc. It is clear that God’s moral law is still in effect, and those who violate God’s law are sinners.